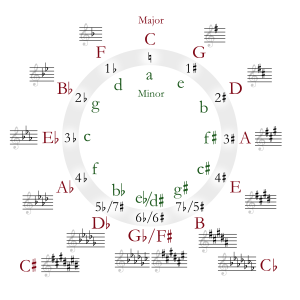 A-flat minor is a minor scale starting on A♭. Its key signature has seven flats. Its relative major is C-flat major, and its parallel major is A-flat major. Its enharmonic equivalent is G-sharp minor. A-flat minor is rarely used as the main key of a piece of music. More often, pieces in a minor mode that have A♭ as the tonic are written in the enharmonic key, G-sharp minor, because it has a simpler key signature. Because of this, there are few works in A-flat minor. In some scores, the A♭ minor key signature in the bass clef is written with the flat for the F on the second line from the top. Leoš Janáček uses it for his violin sonata and the organ solo of his Glagolitic Mass. Moritz Moszkowski used it for his piano étude, opus 72 number 13. A-flat minor is also used in Frederick Loewe's score to the 1956 musical play My Fair Lady; the Second Servants' Chorus is set in A-flat minor. Another example of popular music in A-flat minor is Walkin' on the Sun by Smash Mouth. This page was last changed on 19 July 2013, at 22:20.